Church mission projects are a powerful way to empower your congregation to be the hands and feet of Jesus around the world. At Lifewater, there are many ways your church can get involved to help provide clean water, health, and hope to a village. 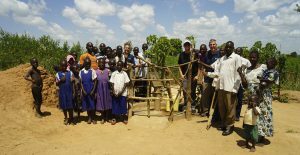 First Baptist Church of Geneva, IL (FBCG) is partnering with Lifewater International to help thousands in northern Uganda get a sustainable source of safe water and sanitation. The effort reaches two communities in remote rural areas that remain difficult to access, and where the high cost of drilling deep wells is prohibitive for the residents. 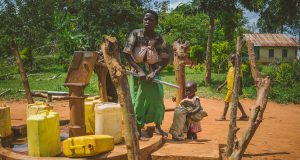 Many Ugandans suffer from preventable, water-borne disease, contributing to high rates of child mortality, malnutrition, missed school days, gender inequality, violent conflict, and stunted economic growth. Along with safe water, practices like using a latrine and handwashing with soap can dramatically reduce the incidents of diseases like diarrhea and typhoid. With water and sanitation, families spend less time fetching water and caring for the sick and more time attending school and working. In many communities in northern Uganda, water and sanitation are the first steps out of extreme poverty. Northern Uganda remains a difficult place for development work because of the traumatic history of the area, where thousands were killed and millions were displaced in violent civil war. In many places, safe groundwater can be found within 100 meters of the surface, but in a few places the drilling must go deeper. In places where the water is deeper, accessing the specialized drilling equipment is often too expensive for the community or government to afford. Lifewater works with the community and government to fill the gap so that everyone in the region can access safe water near their home. Lifewater has been working in northern Uganda for over 20 years, and last year helped over 10,000 people access safe water, sanitation, and hygiene education. The wells are expected to be completed in 2015.